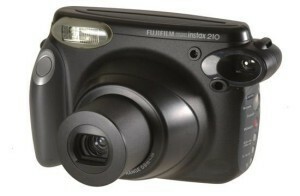 Right now it’s Fujifilm which dominates the Instant photo camera market. People use so many wrong names for these Fujifilm Instant cameras like, Fujifilm Polaroid cameras, Polaroid Fuji cameras etc but all these names are just misunderstanding because people think Polaroid is a type of cameras which is not. Polaroid is the brand or company which has started making instant cameras. But now Fujifilm is doing better than Polaroid in competition with their cheaper but better quality Instax Series cameras. 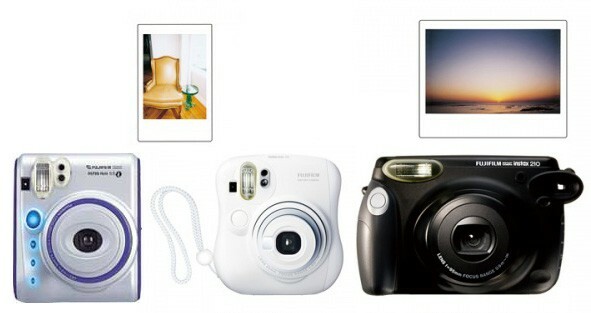 Fuji Instant photosystem is known as Instax. They do have three different devices in this Instax series. Fujifilm Instax Wide film instant cameras. 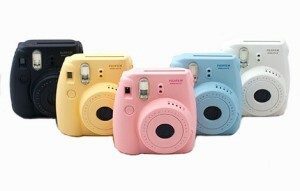 Fujifilm Instax Mini instant cameras. Fujifilm Instax instant mobile printers. This is one of their latest products and the first Instax instant mobile printer model was released in last April to the global market. There are two Polaroid mobile printers already in the market which are Polaroid PoGo Printer and Polaroid GL10 Printer but unlike both these printers new Fujifilm Instax Share SP1 printer has Wi-Fi connectivity. So you can connect the printer to your smartphones, tabs, Laptops, and computers without using cables to connect. This is one of the best features this device has. If your phone has Android Ver. 2.3.3 or later and Google Play or iOS Ver. 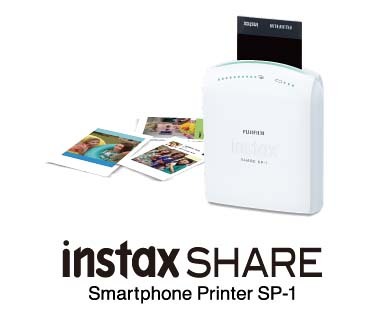 5.1 or later then it’s compatible with Instax Share SP1 printer. All you have to do is download Fujifilm’s Instax SHARE free app and connect. It’s a small device and uses Instax Mini Film as photo paper so print cost is very low too. Another cool feature is SP1 has so many fun photo frames and filters to make your photo prints look better. Also, you can print photos directly with Fuji Digital cameras like Fuji X-M1, Fuji X-A1, Fuji XQ1 and probably with other Wi-Fi compatible digital cameras. You can buy this Fujifilm Instax Share SP1 Mobile instant printer from Amazon for around $180 with free shipping. With photo paper cost like $0.60 print, it will be a great fun when you hanging out with your friends or need to take instant photos of an event like a party or wedding. These Fujifilm Wide film cameras are big and bulky instant cameras which made in the 90s but still, you can find in the market. Fuji no longer producing this model but they do make Instax Wide film for these cameras. The only model you can find in the market is Instax 210 camera which is one of the cheapest Instant cameras in the market today. One reason why this instant camera is different from other Instax cameras is that it uses Instax Wide film which is similar to the old Polaroid 600 film type. Only another instant photo camera which can take 3×4 format photos in the market today is Polaroid z340 which cost you four times as 210 model. Also, Instax Wide film is surprisingly cheaper than old Polaroid 600 film packs which cost you around $5 per photo print. Wide film cost you only about $0.60 per photo print which is same as Mini film and also Polaroid Zink Media photo paper. Fujifilm Instax 210 camera can be bought from Amazon for around $60 with free shipping which makes it’s cheaper instant cameras in the market today. It’s little bigger is size but doesn’t second to any other instant film cameras in the market when it comes to photo quality. Now there is new Instax 300 model in market. Nothing changed there but has a nice slim design. better buy the new model since price difference is very small. 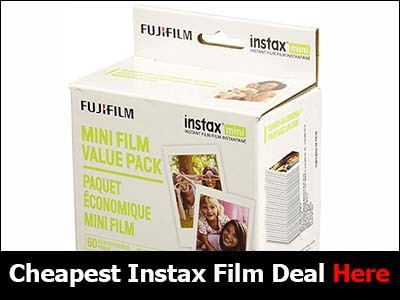 Instax Mini 7s (Outdated, do not buy). Fuji Instax Mini 8 camera is cheap and simple to use But you want to have a camera which has more features and options then go for the Mini 90 model which probably is one of the best in the market today. Mini Hello Kitty is a cute camera. Great for any HelloKitty fan.